I picked up my first Walmart Grocery order today! Overall it was a good experience and I recommend it highly for most people. I do have a few reasons why I don't see us using grocery pickup regularly and I will share those at the end. If you want to hear all about my experience then keep reading, but if you just want the link to save $10 your first $50 purchase, skip down to the last paragraph. 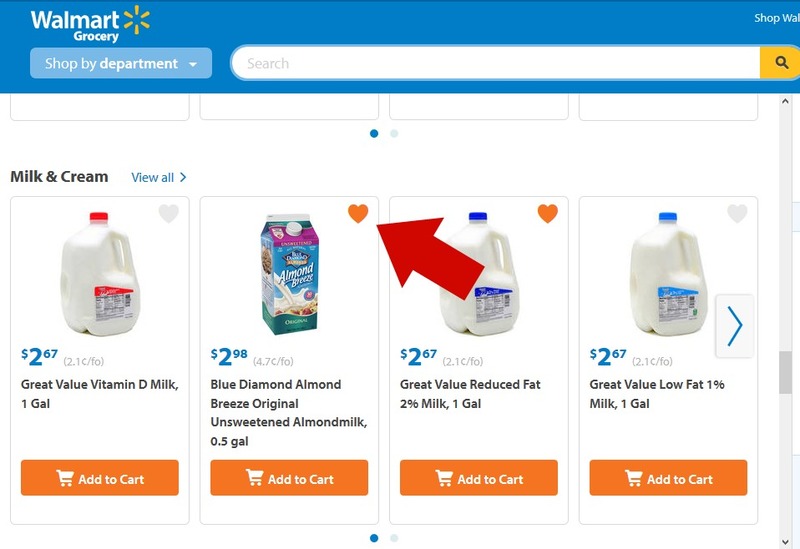 Before I even made my order I searched for a few things that I know I always buy at Walmart and when I found the exact item that I wanted, I clicked on the heart in the corner of the item listing to add it to my favorites list. It was fun and easy to make a list of all my favorite items so that shopping was even easier when I was ready to make a purchase. When you are ready to shop just look for the words "Add items from your favorites" in your cart. Click there and your list will come up to shop from. Easy as pie. You can choose your pick up time first or add items to your cart and then pick a time. When I shopped, the next available pickup was the next day but according to their site you can get it as fast as the same day. You can book a time slot up to three weeks in advance if you are super prepared. The minimum order is $30 for the service. It was convenient to be able to add my grocery items to the cart online, see the total and then schedule a pick up time. Being able to keep up with my total in the online cart made it easy to stick to a budget. (Walmart collects your payment info and the total showed up as pending in my account when I placed the order but doesn't charge you until you pick up so that they prices can be adjusted for things like produce, meats or out of stock items.) Much better than walking around the store writing down prices and adding them up so I don't spend more than I mean to. Plus, I was on my comfy couch in my pajamas-bonus! On the day of my order pickup, I received a phone call before my scheduled time to let me know that my order was ready and to tell me to call to give them 10 minutes before I came to pick up. When I called with my "10 minute warning," I was instructed on where to park and to call when I got to the special parking places and tell them my parking space number. My pickup store is the Walmart Neighborhood Market on Federal Drive. 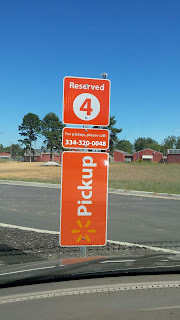 The Grocery Pickup parking is clearly marked with signs leading you from the entrance of the parking lot all the way to the side of the store where the pickup parking places are located. You can't miss the orange signs and you should not be able to not find your way to the right place. My order included some produce and some chicken, so she showed the packages to me to make sure they were acceptable and the contents were as nice as I would have chosen if I had shopped for them myself. One item that I ordered was not in stock so she let me know that I would not be charged for that item. Then she loaded them in my van, I signed for my order and I was ready to go. After you pick up, you get an emailed receipt with the correct total for your purchase. Even though the experience was fun & convenient (not having to take all the kids in the store, being able to drive up and have them load the bags in your vehicle) I don't think it will be something that we will be doing very often and here's why. - I'm pretty thrifty. I buy marked down (close to sell by date) meat if I can find it and there is no chance of getting the mark downs when you order online. I also shop the local grocery stores weekly because they have superb deals on produce and meats and are hardly ever beaten by Walmart on their sale prices. -We prefer to use cash for our groceries. Ordering online and using the credit card for us makes it easier to justify overspending. 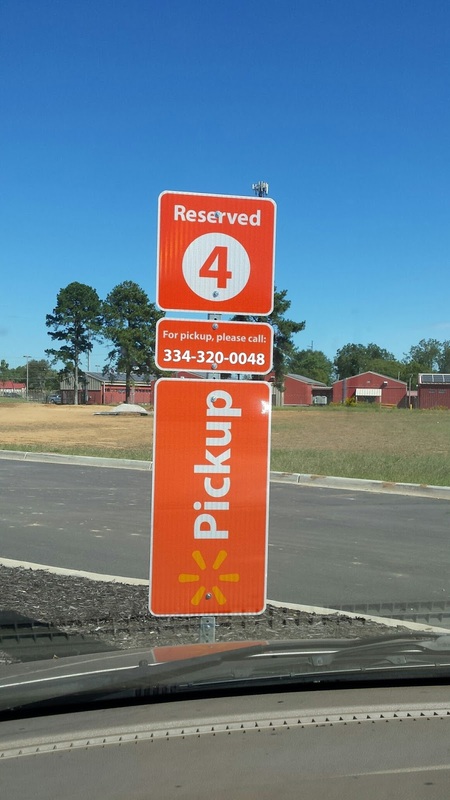 Right now Walmart Grocery Pickup can only be paid for by credit card, not even Walmart gift cards. -There are certain items that we use regularly that the particular Walmart Grocery Pickup store in our city doesn't carry. So after I left with my order I ended up having to go to another Walmart anyway to get a certain pita bread that we eat for our low carb lifestyle. The chance is that they will begin to carry it if enough people request it though so maybe that will change. Click this link (it's my referral link) to save $10 off your first order of $50 or more, then get your referral link and share with your friends to save even more!